Yes, we do windows! Windows in your business space take quite a beating from the elements — wind, rain, snow and ice all deposit dirt on the surfaces. Over time, this dirt and grime builds up and causes tiny pits in your window glass, making the window vulnerable to cracking or even breaking. 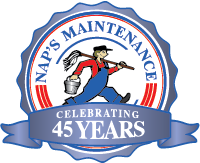 With regular professional window cleaning from Nap’s Maintenance, you can not only keep your windows bright, shiny, and inviting, you can extend the life of your investment.